It happens to be that DHFL is among the favorite stocks that Jhunjhunwala holds, and the big bull has been very vocal about how much positive he is in the sector, especially housing finance companies. Rakesh Jhunjhunwala continues to sell Titan shares: Is it worth buying this jewelry maker stock? The rise and fall of Dewan Housing Finace Limited (DHFL) share price is happening at a fierce pace. Yes, it is a very volatile stock at the moment. However, since the last five days, the fate of DHFL has been very bleak, as investors have been selling the company's shares to a heavy extent. Today was no different, as DHFL continued to decline for the fifth-consecutive day and was trading at Rs 210.05 per piece down by 4.44% on Sensex at around 12:44 hours. However, so far in today's trade, the company has tumbled by more than 8% after it touched an intraday low of Rs 201.9 per piece on the index. Interestingly, one is not really sure where DHFL share price is headed, but that is not the case with Rakesh Jhunjhunwala! He is quite an optimist over NBFC stocks. It happens to be that DHFL is among the favorite stocks that Jhunjhunwala holds, and the big bull has been very vocal about how much positive he is in the sector, especially housing finance companies. Rakesh Jhunjhunwala has since then witnessed some severe shocks from DHFL, but, he says that he sees a bigger picture. To your surprise, when DHFL tumbles it is actually creating a buying opportunity, because many analysts see this stock performing good in coming months too. 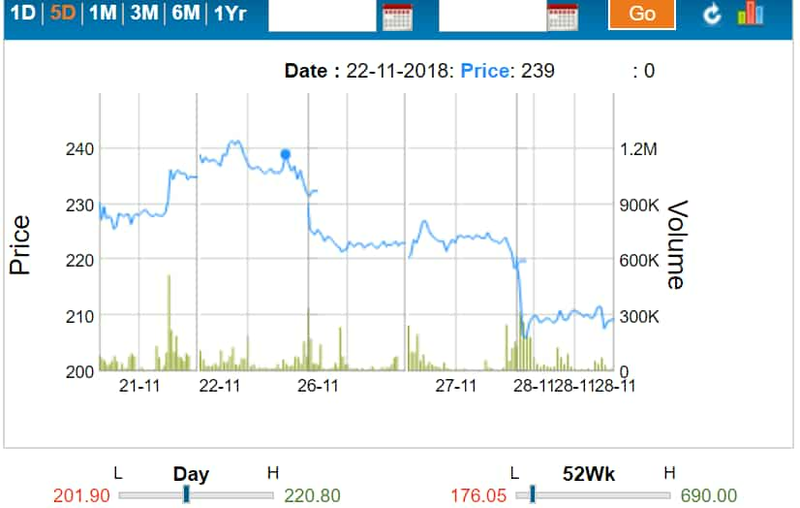 Nevertheless, despite the Rakesh Jhunjhunwala stamp of approval, in five days time, DHFL has tumbled by over 15%, and the company was even trading near Rs 230-mark last week on November 21, which was also the last gains seen in the company. Not much has been revealed as to why DHFL tumbled, but majority of investors have given a buy call. However, Jhunjhunwala who is his own expert when it comes to have an appetite for equity, sees DHFL differently. Earlier during the Diwali festival, Jhunjhunwala gave an interview. When asked about NBFC's liquidity concern, the ace investor showed full faith in the sector and also said that it will not tumble below the level it had seen earlier. He also mentioned that housing finance sector is the need of the hour for economic growth. Coming to Jhunjhunwala's investment in DHFL. In a year, the company has given negative return to Jhunjhunwala, as it has tumbled by over 64% on exchanges! Shocking, but that is the exact amount. It was during September 2018 to October 2018, where DHFL lost its glory days. The company was just not able to restore faith of investors, something that can be blamed on concerns about IL&FS default case. The quantum of loss in DHFL was such, that the company which was trading near Rs 650-level of first two weeks in September, crumbled down quickly to an all-time low of Rs 179.05 per piece on October 25, 2018. But as for Jhunjhunwala, he walked the talk, and showed faith in this NBFC-major by actually increasing his holding in DHFL during July - September 2018 quarter. Jhunjhunwala raised his stake in DHFL by 0.43% to 3.19% with 10,000,000 equity shares which are now worth Rs 222 crore, as per TrendLyne.com data. The data also revealed, DHFL's performance in last one month, which shows a growth of 20.17%. Will DHFL make Jhunjhunwala further rich, or will turn out to be a rare error on the Big Bull's part? Kunal Shah and Prakhar Agarwal analysts at Edelweiss Financial Services said, "While DHFL has been using down-sell route efficiently—sold net pool of INR74.1bn to various banks and FIs over the past 50 days—we believe, incremental funding (availability and cost) will pose challenge for DHFL, which will reflect in softer growth and lower NIM." According to the duo, there are certain uncertainties clouding key parameters: a) AUM growth is likely to take a back seat (low single digit by FY19 end from 38% in Q2FY19)—sharp moderation in disbursements in H2FY19; b) cautious transition to focus completely on retail & cutting project finance to 5% (17% currently) will adversely impact NIMs, earnings & RoE; c) higher sell-down at lower spreads & funding cost rise will pressurize NIM; and d) volatile asset quality & higher credit cost particularly on project finance exposure. Given heightened associated risks, we are building in sharp moderation in AUM, significant pressure on NIM and rise in delinquencies leading us to cut EPS by 49%/46% for FY19/FY20. Still the analysts at Edelweiss has maintained a buy call on DHFL. They say, "Current challenges are likely to significantly reset DHFL’s near-term growth and NIM, rendering earnings vulnerable. Incremental comfort flows from opening of financing avenues, strategy of aggressive sell-down to enhance liquidity and divestment of noncore investments. Given that it’s trading at 0.8x FY20E book, we maintain ‘BUY/SP'." potentially trade at 1x P/BV (current 0.8x) after factoring in anticipated risks in our estimates. Maintain BUY with revised TP of INR277 (INR508 earlier). We will continue to closely monitor developments on funding availability and performance of LAP/project finance book." On the other hand, Phillip Capital said, "We expect Loan book to slow down significantly over FY18‐20, driven by rising cost of funds. Stiff competition in mortgage finance will limit the transmission of higher cost of funds, leading to a fall in margins. We expect spreads to decline to 0.6%/0.7% in FY19/20 from 1.2% in FY18 and similarly NIMs to fall to 2.16% in FY19 vs. 2.39% in FY18. At CMP, DHFL trades at 0.8x/0.7x FY19/20 ABVPS of Rs 296/325. We estimate the company to generate an RoE of 11.7%/11.8% in FY19/20, lower than its cost of equity, suggesting that it should trade lower that its book value. 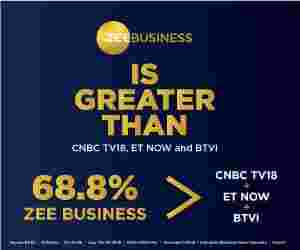 We maintain Neutral rating with a target price of Rs 275." From the above it is clear, that DHFL is seen to grow big going forward. If we take Edelweiss target price, then DHFL is set to rise by over 37% compared to today's intraday low. Hence, rather than shedding tears over DHFL's downfall, why not think in line with Jhunjhunwala, who is not ready to lose his confidence in the company? Significantly, DHFL is believed to recover well in coming months and as such, current lows are a great investment opportunity and, just like the Dalal Street king, you too can be rich beyond dreams as well. NEXT STORY: Rajinikanth's '2.0' vs Reliance Jio, Airtel, Vodafone-Idea, others' battle awakens this scary 'ghost' from past!